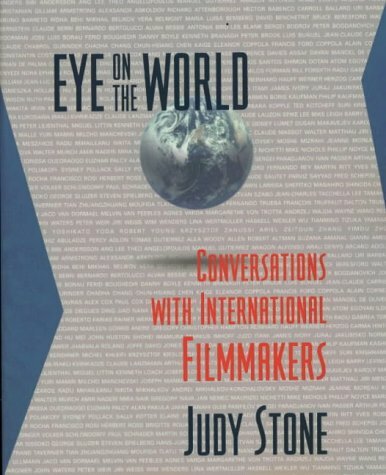 During the 30 years Judy Stone wrote for the San Francisco Chronicle, she interviewed hundreds of artists from all over the world. This huge book collects interviews with the likes of: Federico Fellini, Luis Bunuel, Jean-Luc Godard, George Lucas, Francis Ford Coppola, Brian De Palma, Dalton Trumbo, Werner Herzog, Woody Allen, Manoel De Oliveira, Glauber Rocha, Mike Leigh, Francois Truffaut, and incredibly, Boris Kaufman -- the brilliant cinematographer who shot Jean Vigo's L'Atalante and Kazan's On the Waterfront. If you've ever met Ms. Stone, you'd find it hard to believe that such a tiny person could spar with these heavyweights. But she's got a worldly intelligence that more than matches up. Stone finds directors more interesting than movie stars, so only a few non-directors appear here (actor Walter Matthau and screenwriter Jean-Claude Carriere are examples.) My only complaint is that most of these interviews were centered around a particular film, and hence may seem out-of-date. Each interview is accompanied by a filmography, updated to 1997.